Which Solar Panel Direction (Orientation) Is Best? Solar Panel Direction: Which way should my solar panels be facing? Five or six years ago the question of which direction solar panels should face was easy. Because high feed-in tariffs were available, they simply had to have an orientation facing north in order to maximise the amount of electricity they produced and so earn the most feed-in tariff money possible. But now, except in the Northern Territory and parts of Western Australia, high feed-in tariffs are a thing of the past, so the question of orientation is more complicated because of the importance of maximising self consumption, which is making sure your home uses the most solar electricity and the least grid electricity possible. The concept of self consumption is the key to tiny electricity bills with solar panels – if you don't know why, read this and then come back. 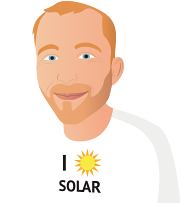 Using your own solar electricity instead of grid power is far more cost effective than receiving a low feed-in tariff for sending electricity into the grid. The more you are charged for grid electricity and the lower your solar feed-in tariff, the more important it becomes to maximise self consumption. Which Solar Panel Direction Will Maximise Your Self Consumption? North Orientation: Panels that face north will produce the most electricity overall. North facing solar panels are often the best choice for people who are at home during the day. Not only because they are there to use electricity when it is produced, but also because it is easy for them to shift demand by using washing machines, clothes dryers, pool filters and other devices in the middle of the day. Because north facing solar panels produce the most electricity overall, they will have the greatest environmental benefit. West Orientation: Panels facing west produce around 12% less electricity overall than north facing solar panels. They also produce less electricity in the morning but more in the afternoon. They reach their maximum output around one and a half hours after noon and just before sunset will produce around one quarter of their peak maximum. West can be a good direction for people with high summer air conditioning demand. It is also an excellent direction for people who are usually out of the house by the time the sun comes up but return in the afternoon. However, because of the reduction in the total amount of electricity generated compared to north facing panels, the increase in self consumption that will result will need to be considerable to make west facing solar panels worthwhile. North-West Orientation: Solar panels that face north-west will produce around 5% less electricity overall than north facing panels. Their electricity production through the day will be between that of north and facing panels and that of west facing panels. They produce slightly more electricity during the afternoon and slightly less in the morning. East Orientation: Solar modules that face east are similar to west facing panels in producing around 12% less electricity overall than north facing ones, but they will produce more electricity in the morning and less in the afternoon. They can suit households with high consumption in the morning, such as ones that use a lot of electric heating on cold winter mornings or people who are out of the house in the afternoon. North-east Orientation: Panels facing north-east provide will produce around 5% less electricity than north facing solar panels and their production through the day will be between that of north facing modules and east facing ones. East And West Orientation: Placing some solar panels facing east and some facing west will result in the total amount of electricity produced being around 12% less than if all the modules were placed facing north. This arrangement is often called and east/west split and has the advantage of producing a more constant output of electricity during the day which can help to increase self consumption. The steeper the roof, the smoother the output of the system will be. An east/west split can normally have a different number of modules facing in each direction. So if a household uses more electricity in the afternoon more solar panels can be installed facing west. An east/west split can suit both people who are home through the day and those who are at home in the morning and the afternoon. South Orientation: For most Australians, south is the worst direction modules can face and some people consider installing panels facing south almost as large a mistake as installing them upside down. In Sydney south facing solar panels will typically produce around 28% less energy than north facing panels and the steeper the roof the less electricity they will produce. But in the far north the difference is not so great and in Townsville south facing solar panels will only produce around 17% less electricity in total than north facing ones. In addition, they will produce more electricity in summer than north facing panels. Because people in Townsville use usually use considerably more electricity in summer than winter as they run their air conditioners, south facing modules can improve self consumption there. In Darwin south facing panels only produce about 15% less electricity overall than north facing panels, but as the Northern Territory still has a high feed-in tariff the most cost effective direction to face solar modules is north. Combining Directions: Panels can be placed in multiple directions other than just an east/west split. For example, some solar panels could be placed facing north and some facing west. This will result in an output similar to north-west facing panels. It is even possible to have solar panels facing in more than two directions. Power Loss Table: This table shows you how much energy you can expect to get from almost any combination of solar panel direction and angle in the capital cities, compared to the 'optimum' orientation. For example, in Brisbane if your panels are facing West (270°) and are angled 20° from horizontal you will get 89% of the energy compared to the optimum orientation of North and 30°. The type of solar inverter you have will affect how many different directions in which you can place panels. The most common sort in Australia are string inverters. Some can only cope with solar panels facing in one direction, but inverters that can handle two directions are now common. String inverters tend to think that wanting solar modules in more than two directions is getting a bit greedy and you are unlikely to find one that can help you with that. Microinverters are tiny inverters attached to each solar panel. As they make each module independent of the others you can face them in as many different directions as you have panels.